Last week, we took a late summer holiday in Katsuura, Wakayama prefecture. 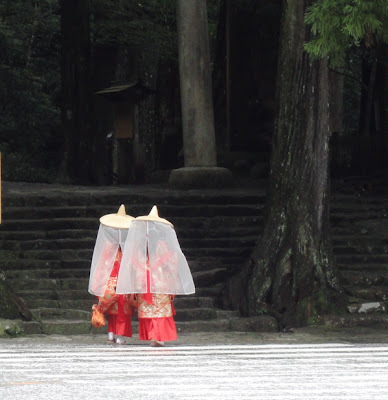 It’s near the border with Mie and close to Nara and the whole area is rich with history – you’ve got Ise Jingu shrine in Mie, where the sun goddess Amaterasu, the legendary ancestor of the Japanese royal family is enshrined. 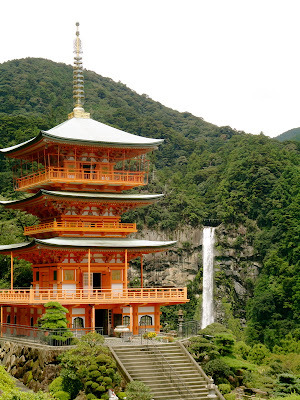 Then there’s the city of Nara, which was the capital of Japan from 710AD and then you have Nachi no Taki, or Nachi waterfall, which predates Shinto as a place of worship. Then if you head west into Wakayama, you reach Koyasan, one of the most sacred places for Japanese Buddhism. Basically, the whole Kii pensinsular is one big World Heritage site! Aside from the history, the area is really beautiful. The densely forested mountains run down towards the sea and the bays are dotted with little islands. In forests full of huge cedar and camphor trees, I felt like I was in the forests of the Ghibli movie, “Mononoke Hime” (although the movie’s forests were apparently inspired by Yakushima, in Kyushu). Katsuura is also famous for hot springs; a perfect place for a short break! But we’re here for meibutsu and omiyage. And there’s plenty! The great thing about staying in a Japanese style hotel, is the kaiseki ryouri, composed of local specialties. Course after course is served up in the comfort of your room. We had local tuna sashimi; Matsusaka wagyu beef from nearby Mie – one of the three “top brands” of Japanese beef; and wakayama plums – both pickled as umeboshi and made into umeshu wine. One night, dessert was a simple chilled mikan (mandarin), another Wakayama specialty, and sweets made of kinkan (kumquat). The restaurants around Kii-katsuura station offer a crazy variety of different tuna dishes. 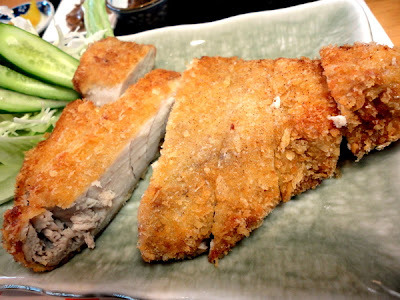 I tried maguro katsu, essentially a crumbed and fried tuna steak, which was delicious and meaty, but I wished it had been left a little pink in the middle. 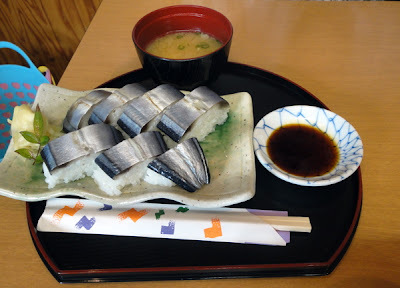 The best meibutsu we tried was also the simplest: sanma sushi and mehari sushi. Sanma (pacific saury), is lightly pickled with salt and vinegar; a little similar to saba sushi, but the taste is lighter. I think there was a little yuzu in the pickling vinegar – there was a slight citrus tang. The other specialty, mehari sushi, looks deceptively simple. 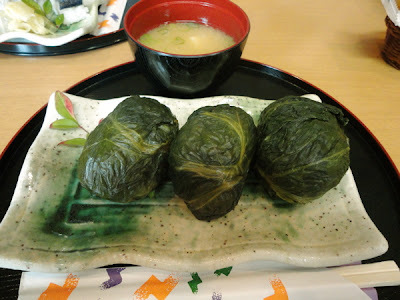 It’s a big rice ball, wrapped in salted mustard greens. The name “mehari” apparently comes from the way you have to open your eyes wide when you cram one in your mouth. My husband said hopefully, “oh, maybe you could try making these at home!” so I asked the lady selling mehari sushi bento what kind of leaves she used. She told me it was takana, a kind of mustard leaf. But the hard part is in preparing the leaves – they’re sun-dried and salted, then washed and squeezed and the tough stalk cut out. The stalk can be diced, mixed with a little soy sauce and mixed with the rice if you want. The leaves are also dipped in soy sauce, then wrapped around the rice. Leave them for a few hours to let the flavour soak into the rice. Delicious! 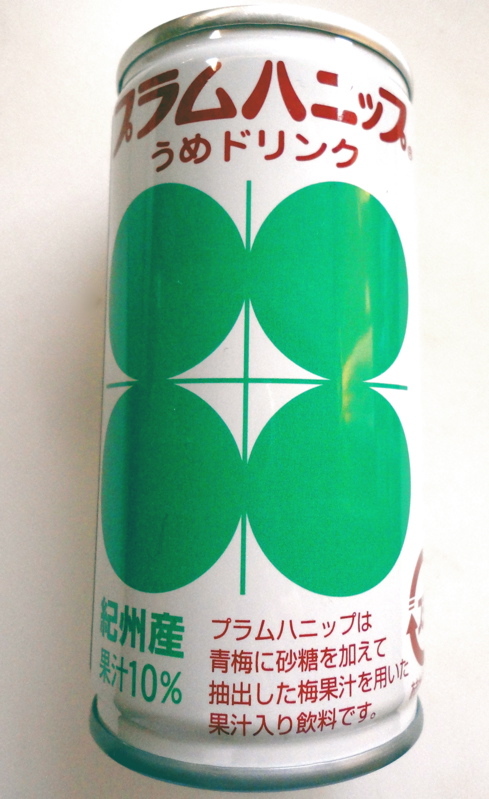 I think I need to make a trip to the Wakayama store near Yurakucho station to look for pre-prepared takana leaves. 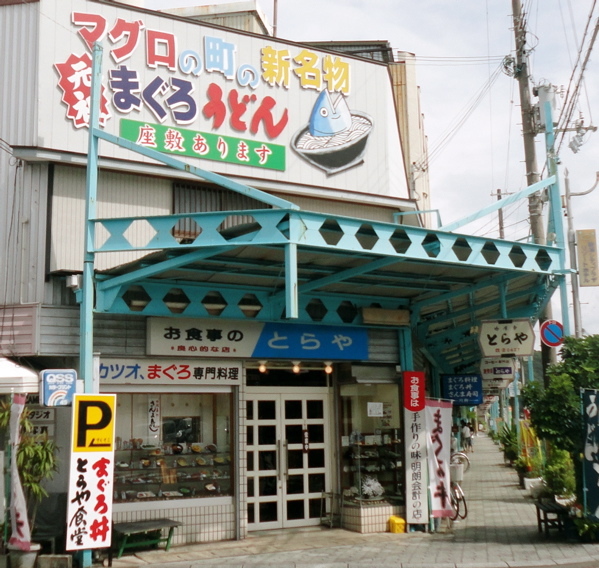 Around Kii-Katsuura. Maguro udon looks interesting! 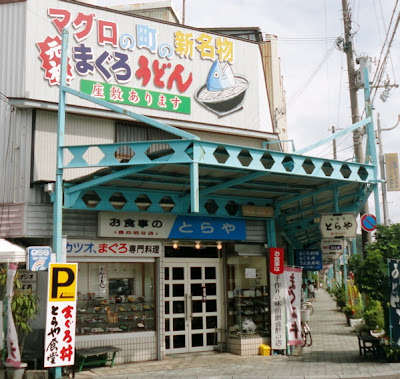 If you like sweets, try the local kuro ame – black sugar candy and kuromitsu – brown sugar syrup (kuromitsu icecream is delicious! 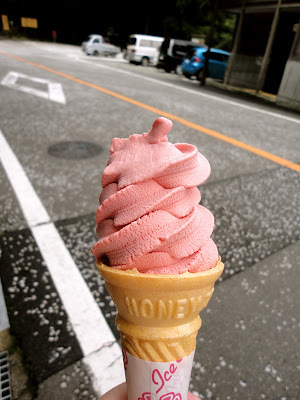 I also recommend the ume, plum soft serve icecream near Nachi Falls – it’s just slightly sour like umeboshi: really refreshing!). Citrus fruits are a specialty of Wakayama – not just mikan, but dekopon, yuzu, kinkan, hassaku and jabara. We found a little fruit shop near the station offering “sherbet” made from various citrus fruits. Perched at the plastic picnic table out the front, eating dekopon sorbet while watching the passing parade (no cars, one old lady with a dog, one fisherman in rubber boots) on the very sleepy Showa street, was a very relaxing way to kill time before our train home. 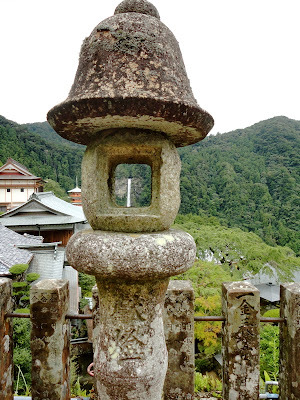 You’ll find a lot of things carved out of black stone around the Nachi area, and almost every home and hotel has a huge chunk of black stone in the garden or entrance. It turns gorgeously glossy in the rain. We have one at home too, a gift from a relative from years ago. Now I know where it came from! I bought a little daruma made of the stone, but I was really looking for a good three legged crow, called “Yatagarasu”. You see the crow motif all over the area – from the Shinto shrines to the local bus station. Apparently, the crow was a messenger of the gods, and a good navigator. No one seems to know why he has three legs. 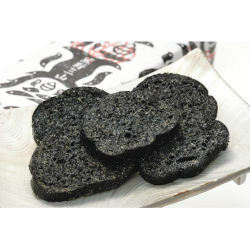 Had to buy these Kumano Sanzan black rusk sweets made with kuro ame, just for the stylised crow wrapping! 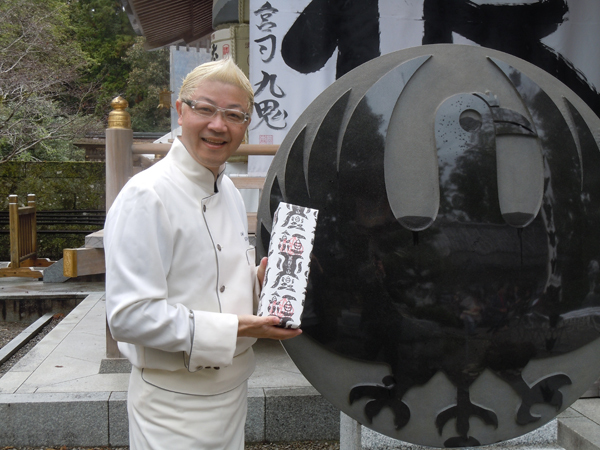 Kumano Sanzan Black Rusk was launched this year - it's made by celebrity confectioner Hironobu Tsujiguchi. Here he is with a black stone, three legged crow. Inside, they look terribly burnt, but they're tasty and very crunchy. Getting there: The trains and major roads wrap around the coast, so it can take hours to get around Wakayama. We took a train from Nagoya, the “Wide View Nanki”, an express train which takes almost four hours, but the scenery was beautiful. It’s a diesel engine train, so it sounds like a tractor is driving you there! Getting to the shrines is also pretty easy – there are buses from Kii-Katsuura station up to Nachi falls (you can also get off halfway up the hill and walk up the historic Daimon Zaka, a beautiful, paved forest path for pilgrims – takes around 30 mins, but a LOT of stairs). 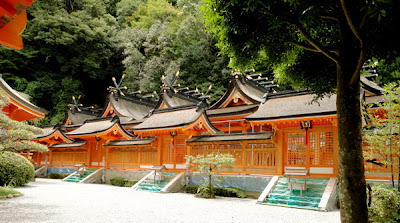 If you want to visit Hongu shrine, Kamikura shrine (built under a huge rock) and Doro gorge, you can take buses from Shingu station. 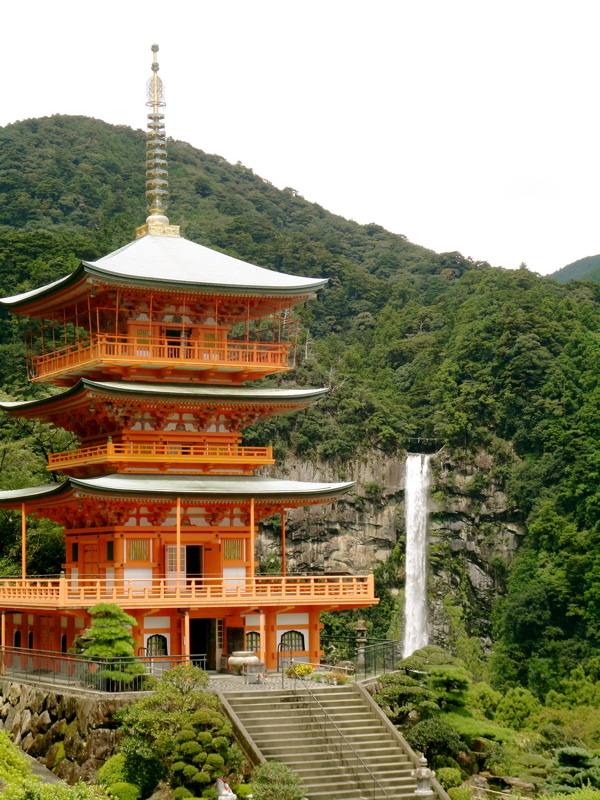 If you want to spend most of your time on the other side of Wakayama and Koyasan, it’s probably better to take a train from Osaka. The sweets and fruit sound absolutely delicious, and I'd happily travel all the way for just one mouthful of that ume ice cream. 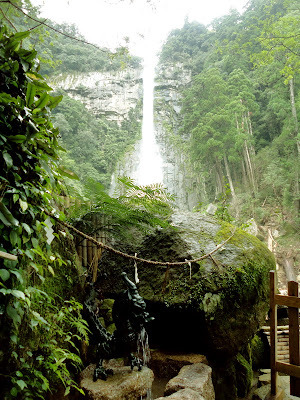 It is such a lovely place, you have to go! 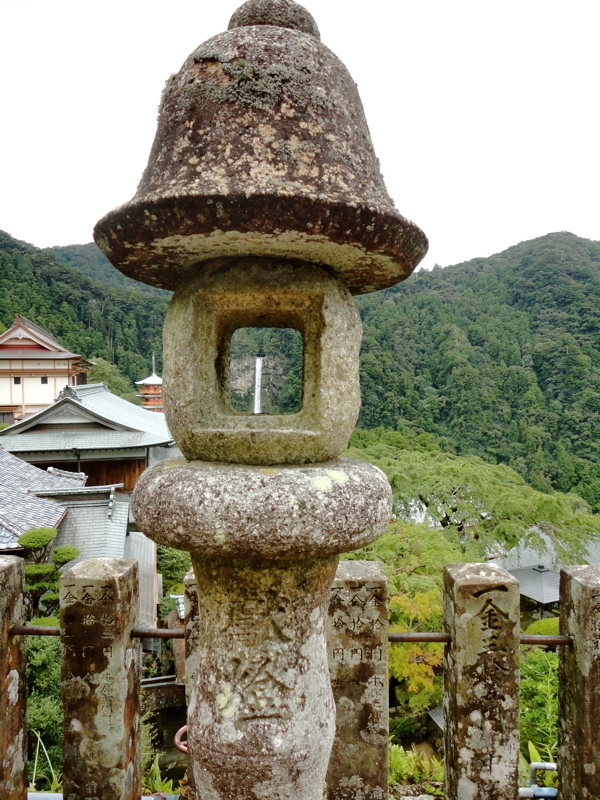 We did bits of the Kumano Kodo, but there are a lot of uneven stone stairs and it was HOT. There are stacks of walking sticks to borrow though. And yes, ume ice cream is highly recommended! Oh wow, a vegetarian meibutsu!